Hut, hut, hike! It’s time for football season! Whether you’re a hostess who prefers to cheer from the couch, a diehard fan braving the weather in the stands or an on-trend tailgater, we have you covered so your outfit won’t be a missed field goal. Plus, did you think our Stylists only knew about fashion? They know their stuff about the ol’ pigskin too. Keep reading to see three looks to wear and game-time tips for keeping the conversation going at the game this fall. If you’re hosting a game-day party from the comfort of your own living room, slip into your comfiest leggings so you can run from the fridge to the TV without missing the big pass. 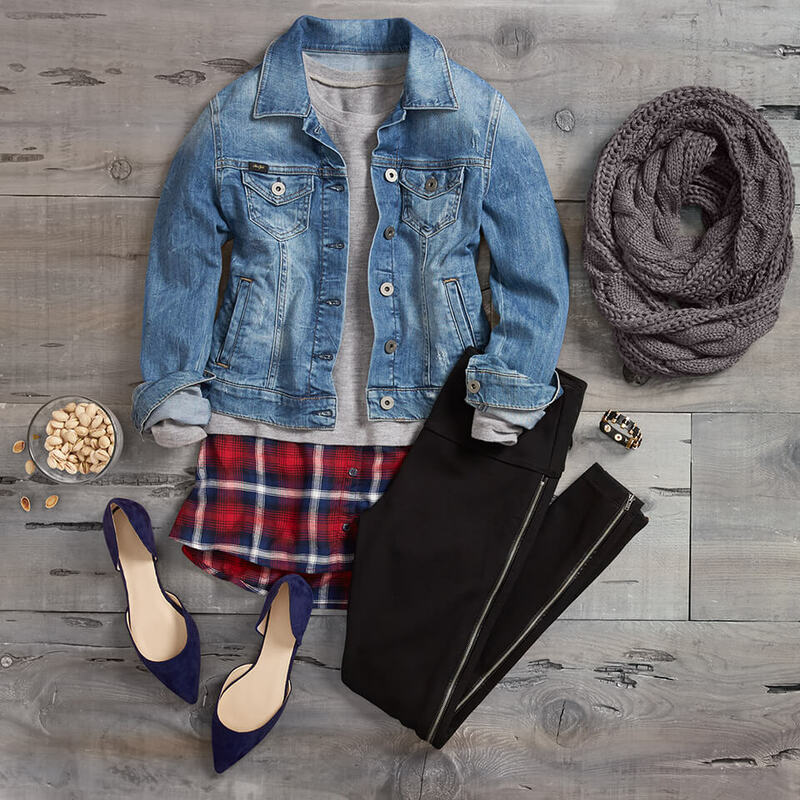 Keep your look classic and comfortable—try repping your team’s color in an unexpected way, like a plaid shirt. Talk the Pigskin Talk: If you’re not a football connoisseur, ask your fellow football fans who’s on their fantasy teams and how they’re doing. You’ll sound like you’re all about that fantasy league! Whether you’re in the nosebleeds or right at the 50-yard line, you can still hang with the die-hards without wearing a jersey. Dress the part in your team’s colors with a chunky knit sweater. Another chic way to show off your #teampride? Rock your team’s colors in an on-trend pair of colored denim. Don’t forget to pack an extra layer, like a puffer vest or a cargo jacket to keep warm. Football Lingo Tip: The red zone is the part of the field (inside the 20ish yard line) closest to the end zone. If a team is in the red zone they have a good opportunity to score. If tailgating means running into old college friends (or an old college flame, wink, wink) why not show up slightly dressed up? 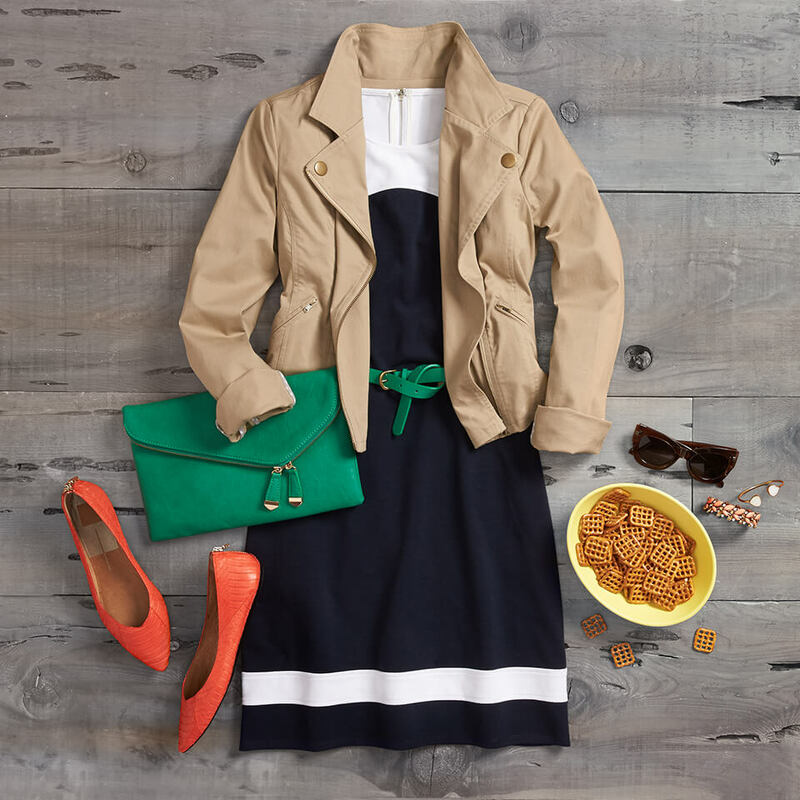 Get game-ready in a casual fit & flare dress—one with a sporty varsity stripe makes it not so formal—with a structured, neutral jacket for layering. Keep yourself comfortable but fabulous in a pointed-toe flat and bright clutch in your team’s hues. Talk the Pigskin Talk: After a touchdown, “going for two” means passing or running the ball into the end zone to get two points instead of kicking it through the goal posts for one point. Want more football know-how? Here are more couch-chatter tips! Teams have 4 downs to get 10 yards. We say “1st and 10″, 2nd and 5”. If you see a penalty called during the game that your fellow game viewers are disagreeing with, ask if the coach will challenge the call, which calls for a review of the play. A “deep ball” is a long pass. A “sack” is when the quarterback is tackled behind the line for a loss of yards. “ground game” is running the football instead of passing.